This is a stratospheric lidar which is configured to fly on the NASA DC-8. It is a zenith viewing instrument, which makes vertical profile measurements of ozone, aerosols and temperature. Stratospheric ozone can be measured at solar zenith angles greater than ~30 degrees, while temperature and aerosols require SZA > 90 degrees. The SNR is maximized under dark coonditions. The measurement of Near-field water vapor measurements is being investigated and could be readily implemented. 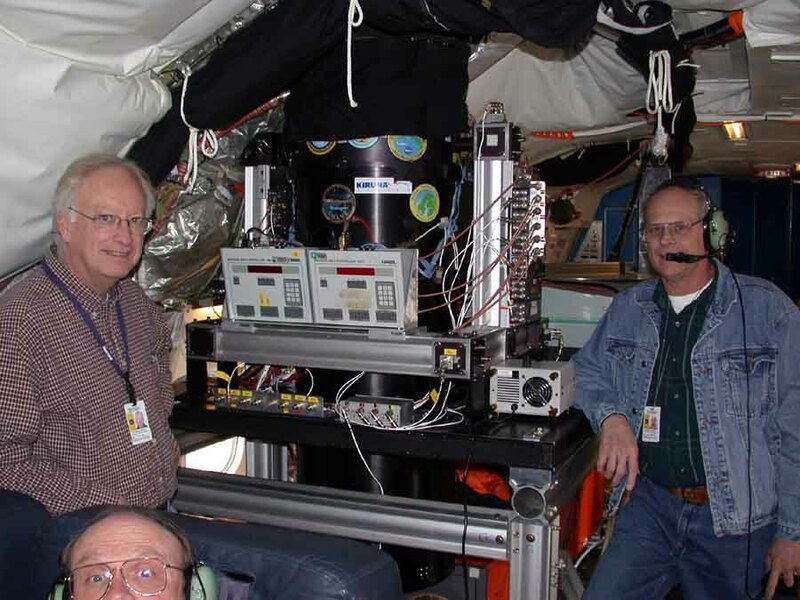 The instrument utilizes a XeCl excimer laser and a Nd-YAG laser to make DIAL, Raman DIAL, and backscatter measurements. A zenith viewing 16" telescope receives the lidar returns. Burris, J., et al. (2002), Validation of temperature measurements from the airborne Raman ozone temperature and aerosol lidar during SOLVE, J. Geophys. Res., 107, 8286, doi:10.1029/2001JD001028.